While re-organizing my craftroom (AGAIN), I discovered some forgotten-about, long, blank cards from Making Memories. Although Ben Franklin Crafts no longer carries this product, I thought that the long rectangle format would be something fun to work on for a change from the standard card shape. The inner card slides through the the band cut in the outer card. I used a The Greeting Farm stamp ( I don't know the name) because the card is for someone special who loves cats (and the color turquoise). 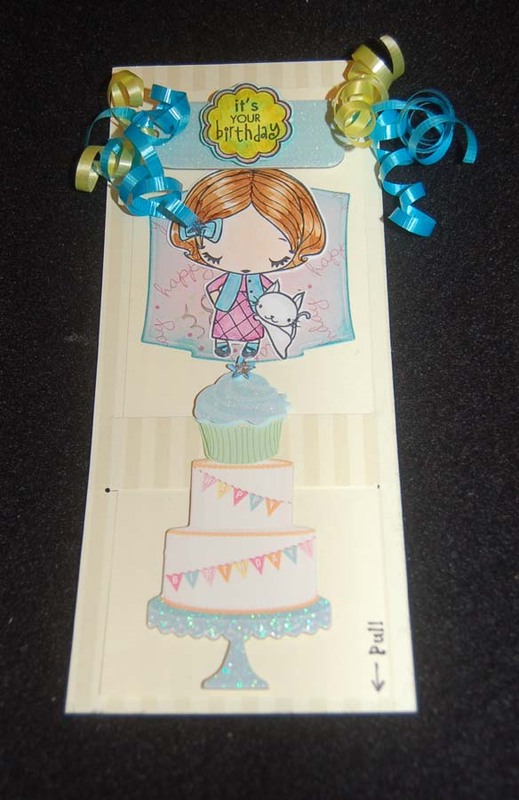 The image was colored with Copic pens and the die-cut cardstock embellishments are from either Martha Stewart or K and Co. The fun part is when you slide the inner card through the band, the secret message (Stampendous stamp) is revealed. 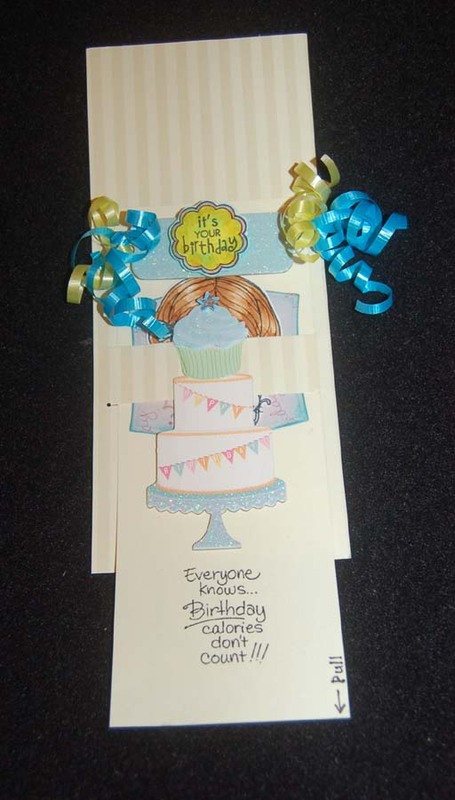 If you decide to make a card like this, be sure to make the part of the card that slides thorough the band free from any thick parts as they will stick in the band. Oh, the 'It's Your Birthday" is a stamp from a Hero Arts set. 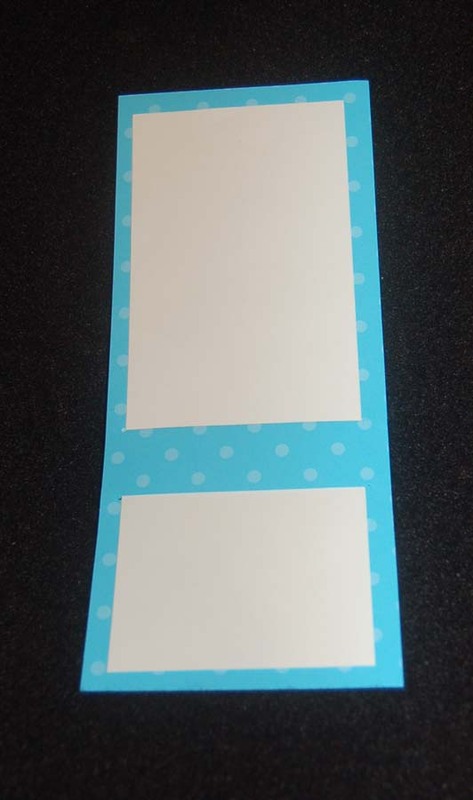 The bottom photo shows more clearly how the card looked before it was decorated. See how simple it is? You can easily make this card base. I recomment using sturdy card stock if you are going to add a lot of embellishments. 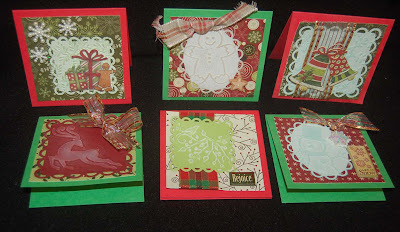 Break out of your card rut and try making this card. Thanks for visiting this blog. I love hearing from you, so leave a comment if you have the time. Whisk together the first three dry ingredients and set aside. Cream sugars and butter. Beat in egg and add vanilla. Stir in mashed banana. Blend in dry ingredients, oats, walnuts and chocolate chips. Using two spoons, scoop out dough to form 16 - 18 cookies on two parchment paper lined cookie sheets. 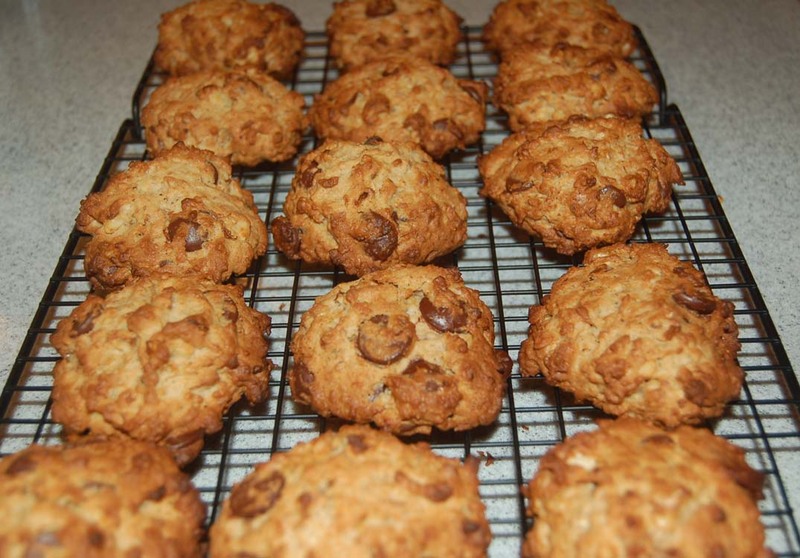 Bake in a preheated 375 degree oven for 14 to 15 minutes until cookies are a yummy brown. Cool cookies on a rack and enjoy! 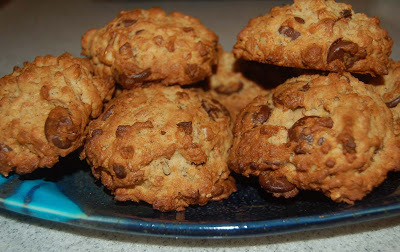 The cookies did not flatten out like most chocolate chip cookies (because the recipe has less butter) but you can flatten them before baking and they will look more traditional (baking time will be less). This recipe is great for using up that one last banana that no one wants to eat. LOL! I hope that you will try this recipe and resolve to eat healthier. I heard a sobering statistic: It is predicted that 1 out of 2 people in Hawaii will be diabetic in the next generation. Take care of yourself and your family so you can live long, happy lives. Every year I can't resist sending my too-old-for-Halloween sons some candy. They always say,"Stop it MOM!". This year I'm mailing them Halloween caddies with Post-It note pads and mini-pens. Hmm-mm-mm the Martha Stewart treat bags would be perfect to send some non-candy treats like tea or li hing mui... hee-hee LOL! 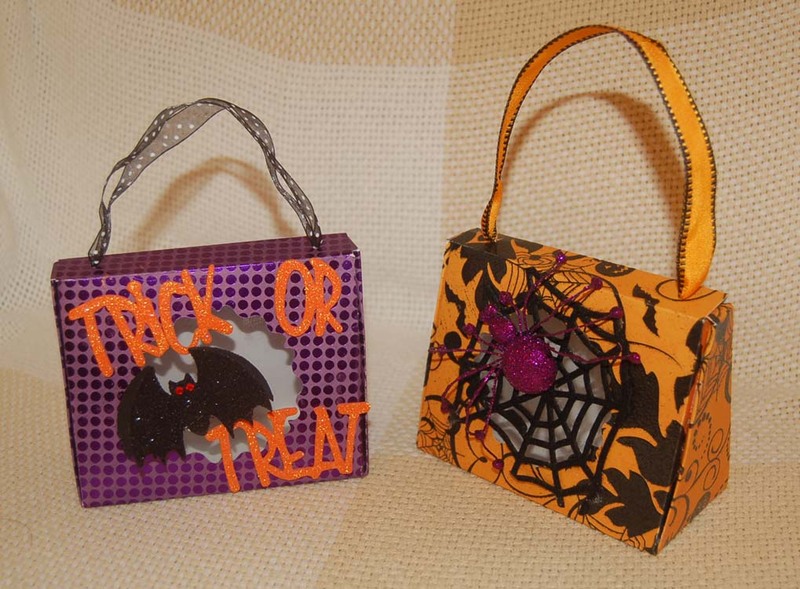 The caddies were constructed from a Sizzix die-cut chipboard upon which I glued Halloween paper before cutting. By swapping the two parts, two different looking caddies were made. The plastic skeleton keys are Jolee's stickers and the labels used die cuts from a huge K and Co. package. 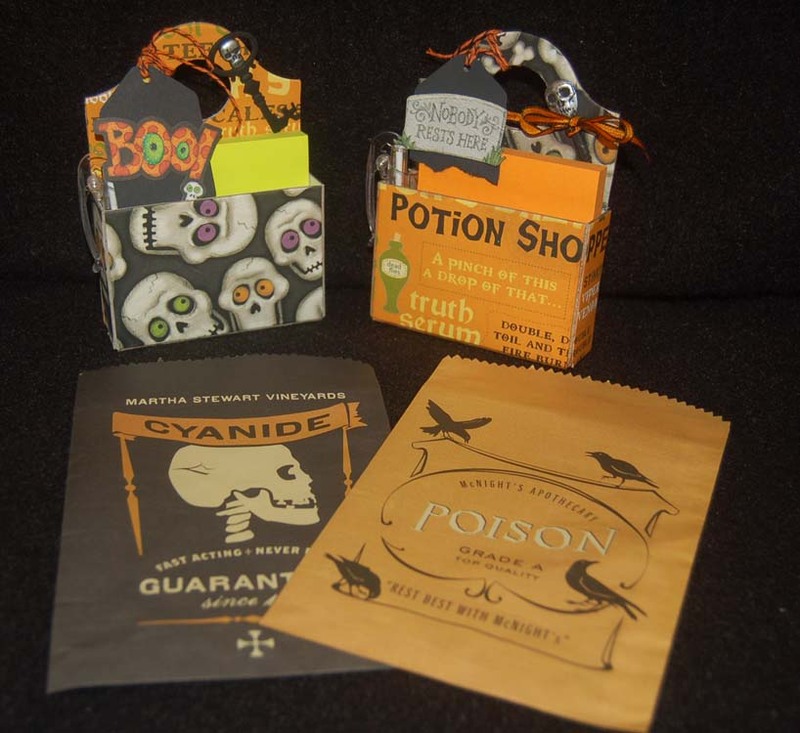 You can find lots of Halloween embellishments at Ben Franklin Crafts but you need to hurry 'cuz Halloween is just a couple of weeks away. Shh-hh! don't tell my boys that their silly old mom is going to send them Halloween stuff again......but it's not candy! 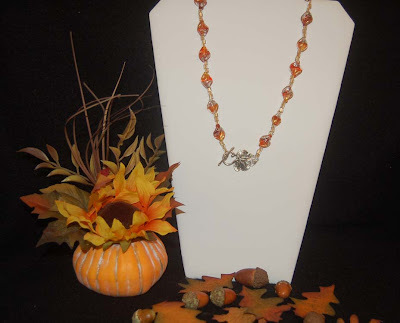 Remember the last autumn necklace photo I posted? I made that necklace for myself after unsuccessfully trying to make one for a gift (just couldn't figure what style to make). Well, I finally came up with a simple wire strung bead necklace with a cool leaf clasp. The beads from Ben Franklin Crafts are a perfect choice because the recipient really loves glass beads after going to Murano, Italy. I know she bought some beads there. I scanned old photos and searched my memory to remember the styles and colors of jewelry that she wears. I feel confident this easy front closing necklace will please her. 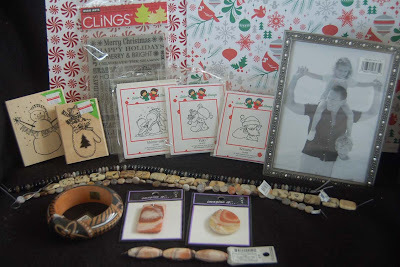 The photo below shows the last of my extra card boxes decorated for autumn and filled with the necklace (in a ziploc bag so the necklace won't fall out). The Sister Stamp image was colored with Copic pens. The umbrella and kimono were paper pieced. The words were stamped using a Dandelion Design stamp from Ben Franklin Crafts. 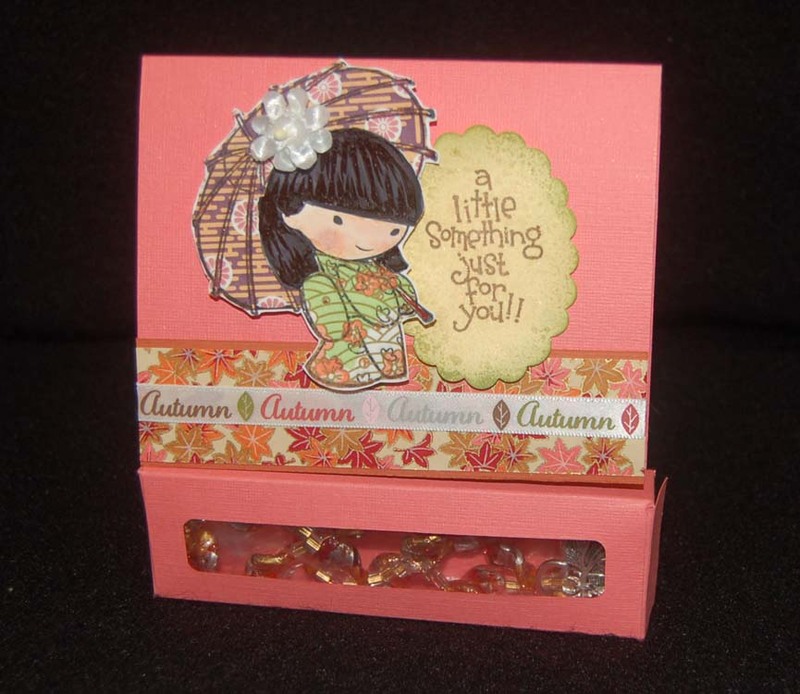 The ribbon and autumn leaf washi paper are from BFC, too. I can't wait to give this gift because it took me so long to decide what to make and I'm excited to see if I guessed right about her taste in jewelry. Happy autumn crafting! I haven't really taken out my Christmas craft stuff (still working on autumn) but since I was testing out my latest holiday purchases I decided to turn the tests into cards for Kris who will give them to her aunt to go with her stuffed dolls for sick children. This is Kris' blog site address:(http://klusivekreations.blogspot.com/2011/09/make-child-smile-this-christmas.html). You can donate too, but you need to send it to her by Nov. 1st and don't put any glitter on your 4x4 card (no envelope needed). 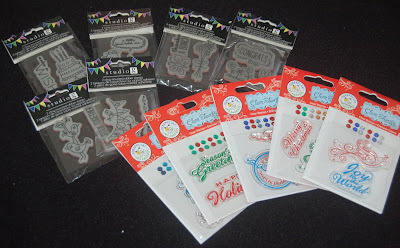 Mostly I was playing with the Sizzix embossing folders (see photo below) which I used on paper from the Whitewash pack, available at Ben Franklin Crafts. 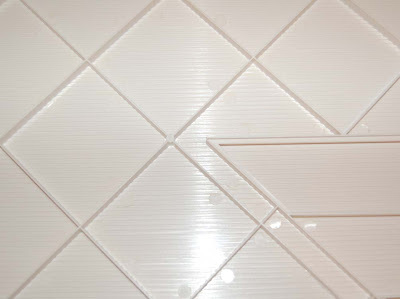 The embossed designs were lightly sanded to bring out the under-color. I really like the two packages of K and Co. stickers (also from BFC) because of their vintage look and the fact that one set has layered die-cuts and the other has foil highlights. I hope that all you wonderful, generous crafters in blogland will help Kris out (she needs 150 cards). Thanks for reading this and please stop by again. 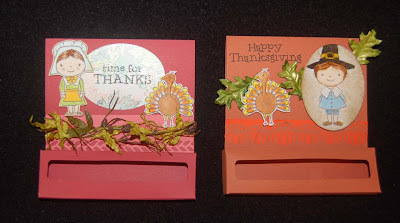 After looking at my extra undecorated candy box cards (others were decorated for Halloween in a previous post), I decided that they would make great place cards for our Thanksgiving dinner. 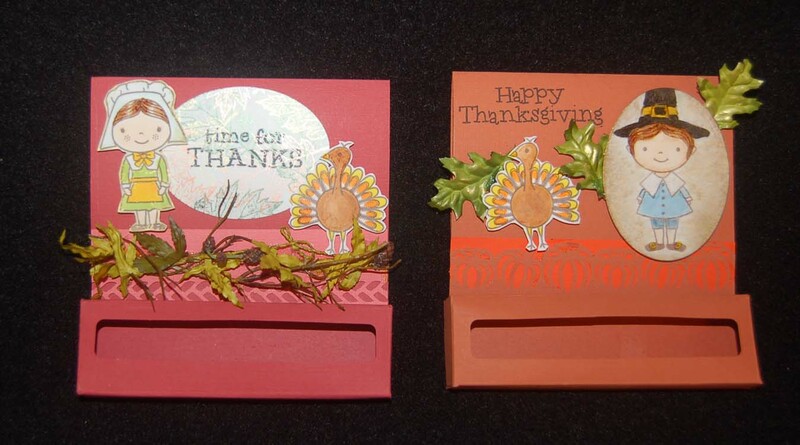 Using the Thanksgiving Hero Arts clear stamp sets (see previous post), some border punches, and faux autumn foliage I purchased from Ben Franklin Crafts, it was easy to assemble the card boxes. Filling the boxes with autumn themed chocolates will help to stablize the cards so they will stand up on the table. The guest's name could be attached somewhere on the place card (unless you are having a dinner for hundreds) and a small personal note or the menu could be written inside the card. Thank you for stopping by and I hope I've given you an idea to spice up your Thanksgiving dinner. Gobble, gobble, gobble! Every year I promise myself that I won't buy new stamps, but when the holiday stamp designs come out I lose my will power. Here are some of my irresistible purchases from Ben Franklin Crafts. 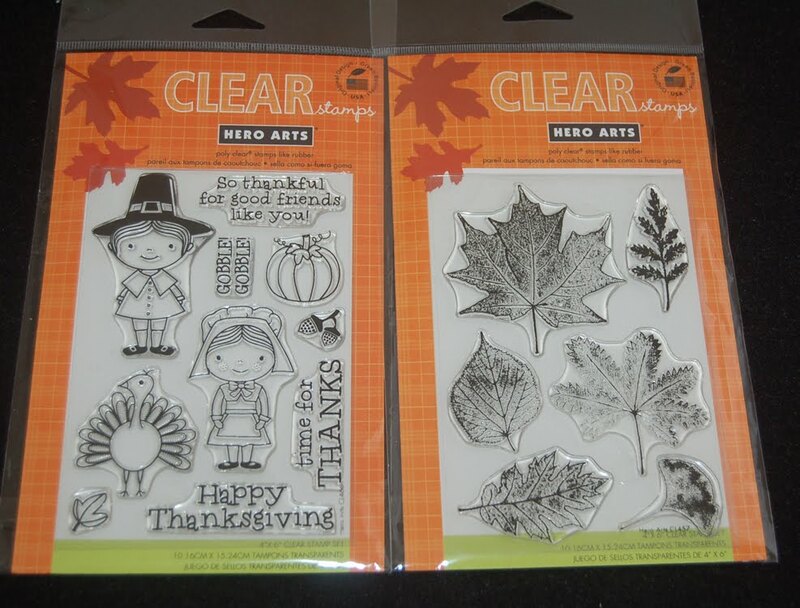 I love autumn leaves and cute Thanksgiving stamps are hard to find; so these two Clear Stamp sets from Hero Arts were easy decisions and basically jumped into my shopping basket. The G Studio stamps are always a bargain at $1.25 each so when I saw these adorable Xmas sets (some with crystal stickers) it was a no-brainer purchase. I got extras for stocking stuffers and card add-ons. That's all for now.....stamp, stamp, stamp......stamping all the way! 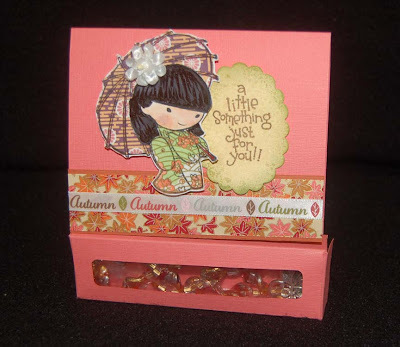 I saw these candy box/cards on a blog site (Crazy for Paper Crafting , Thurs. March 3, 2011 ) but they were sweet Girl's Day ones using the Sister Stamps. I thought that they were the perfect format for some spooky ones. 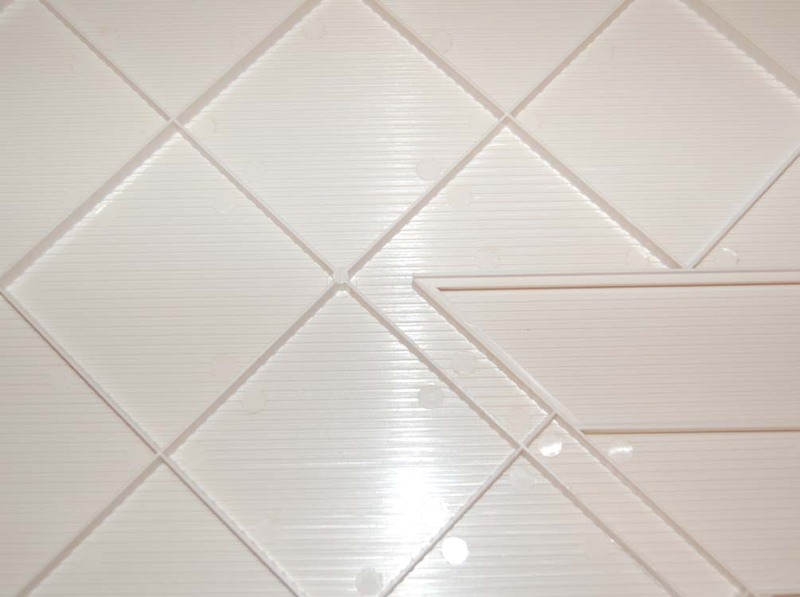 The measurments given for this project did not seem right and the card kept turning up short. Also I wanted to be able to cut them from 8-1/2" x 11" Halloween colored paper that I bought in a pack from Ben Franklin Crafts. To reslove the problem, I cut and folded the box part using the measurements given but border punched the edge of the card and folded it at the end of construction. This way the card will always be the right size no matter what border punch you use. (I used a Martha Stewart spider web border punch from Ben Franklin Crafts.) I taped on strips of contrasting paper to make the design stand out and added assorted stickers and MS punched spiders. Hope you're getting ready for that spooky day! Thanks for visiting. Autumn is my favorite color season. I love the warm colors and reflecting on the year's accomplishments. I started making a necklace for an autumn gift but it wasn't turning out right. Since I had all the beads out, I made myself something new to make an old blouse look new. (Click on the photo to see the details.) 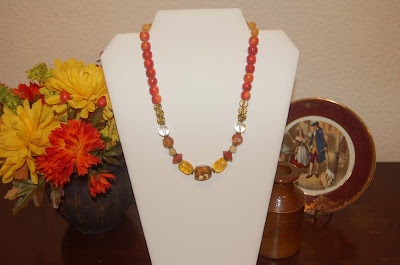 I was pleased with the outcome, but now I still need to make something special that will suit the person to whom I intended to give the necklace. I've decided that a delicate glass bead necklace will match her best. I'll show you what I create for her in an upcoming post. Happy Autumn! These handled boxes had their start from a Bigz Pro die that I had forgotten about. Something about the boxy purses with ribbon handles reminds me of animal cracker boxes. Remember those red boxes with circus animals that you carried around until every last cracker was eaten? Good memories! 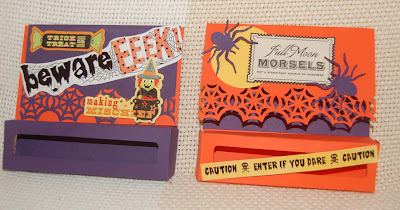 Anyway, the fun of those small-kid times inspired me to turn that Sizzix die shape into something for Halloween. By using a Spellbinder peony nestible die to cut out an opening in the front of the purse, I was able to make a window (tape acetate behind the window) to show the enticing contents of the purse. The peony shape has a wavy edge so you don't have to be so precise about where you place it on the front of the purse, but lots of other dies would work as well. (Cut out the window before you fold the purse.) I taped the purse together with Merikan double-stick tape. The glittery words are stickers I found at Ben Franklin Crafts and the velvety web was cut out from a Martha Stewart ribbon roll also from BFC. The bat was made from glittered black paper and punched out using an MS punch. (Red crystal eyes were added for a scare factor.) The purple glittered spider (which can barely be seen on the web) is something I bought last year from BFC as are the cardstock used for the purses. Ben Franklin has an ample supply of Halloween decorations and supplies so I'm sure you can find suitable substitutes this year. 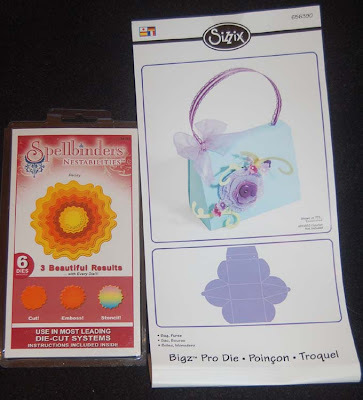 The bottom photo shows the picture that came with the purse die and the Spellbinders peony die. Isn't it hilarious how far I deviated from that sweet, flowered, girly purse?.....must be my evil imagination. Boo-rah! You have to be quick to beat Sweet the writer of the Sweetland Paper Treats blog. She figured out the answer for my 'What is it?' contest within an hour after it was posted. Others were correct (or nearly correct) but Sweet was the fastest. I will contact you, Sweet, to obtain your mailing address so I can get the BFC gift card to you . Congratulations Sweet, and thank you to everyone who entered. Please visit this blog as often as you can because you never know when I'll come up with another contest. Remember the clever early bird gets the gift card. LOL! The photo here shows some of the yummy craft goodies I couldn't resist at Ben Franklin Crafts this weekend. Starting from the back are two American Crafts 12x12 Xmas print double-sided cardstock sheets. I bought multiples of each design because I'm not sure what I'll create with them. 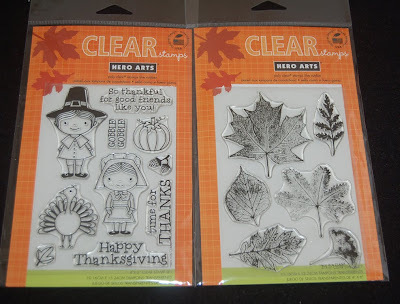 My most exciting find of the weekend were the new Xmas Sister Stamps. There are three different ones and they are all as cute as can be. 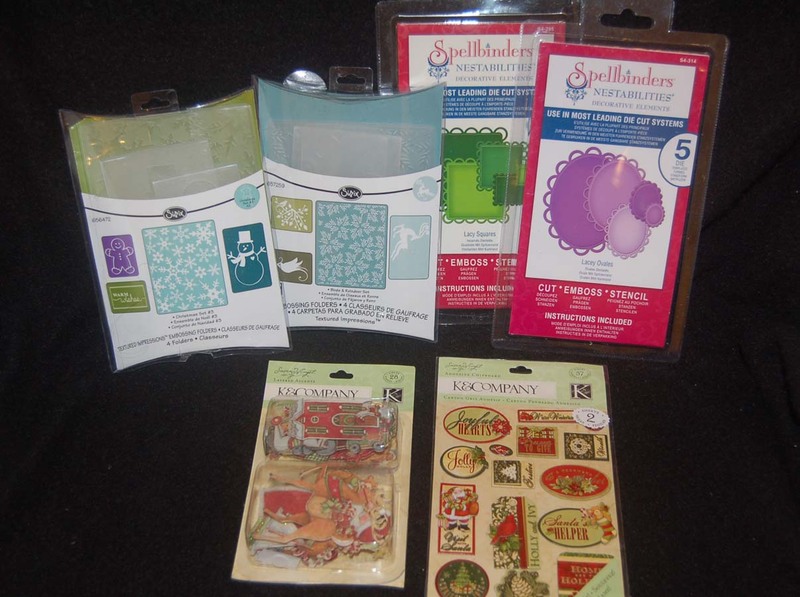 I can't wait to get started on my Xmas projects so I picked up a word background Cling stamp. and two wooden ones all from Hero Arts. They should work well with my new AC cardstock papers. The pretty, sparkly picture frame really caught my eye and will be the home for our 2011 Christmas photo. The beads will be used to fashion some gifts and were chosen because of their beautiful neutral tones.....safe choices if you don't know what color the recipient will wear. Can you see the beautiful wooden bracelet in the photo? It looks like inlaid wood but actually it is handpainted. I bought it for a gift but I think it will be a gift to myself (heh, heh). It was very reasonably priced and would make a beautiful present for anyone who appreciates jewelry with island influence. The Bead Shoppe in BFC has many designs from which to choose. I hope that you enjoyed this peek into my shopping basket and will return to see what I make with these goodies. Have a good week! Do you know what this is? If you are the first to send me a comment identifying the item (from Ben Franklin Crafts) you will win a BFC gift card. You need to accurately describe the product and the company who makes it. The time of the posted comment will determine the winner if there are two or more correct answers. Only one guess per person. The contest will last until there is a winner or 1 week has past. If you are the winner you will have to send me your mailing address so I can mail the gift card to you. Okay, send me the winning comment!